As powerful as statistical analysis with histograms is for making sense of large amounts of data, it's sometimes useful to view the source waveforms that correspond to an individual measurement in the histogram for more detailed analysis. 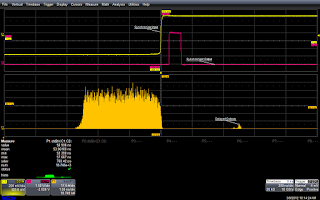 The oscilloscope has already captured the source waveforms, but how can we find the ones we want to look at from the histogram? 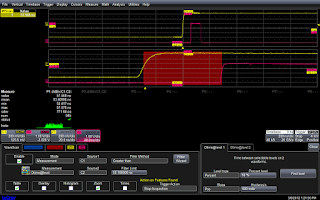 Many Teledyne LeCroy oscilloscope models offer a high degree of integration between various functions. 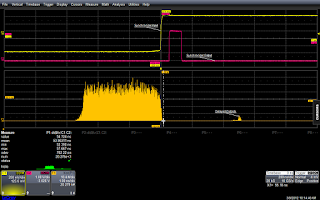 When it comes to digging into the data compiled in a histogram and the source waveforms behind it, the WaveScan scan and search analysis tool is an extremely powerful tool. The bottom trace in Figure 1 shows a histogram plot of delta time at level (dt@lv) measurements. What this histogram displays is the uniform distribution of the delay between two source waveforms shown in the traces marked C1 and C2. These waveforms are from a trigger circuit that synchronizes an external event (C1) with an internal 400-MHz clock to produce a synchronous pulse output (C2). The expected delay between the input and output is uniformly distributed over a range of 2.5 ns. However, unexpectedly, a few output pulses are delayed by another 2.5 ns. Of course, we want to get a look at these pulses, and that's where WaveScan comes in. WaveScan permits scanning the acquired waveforms for events that meet set measurement limits. 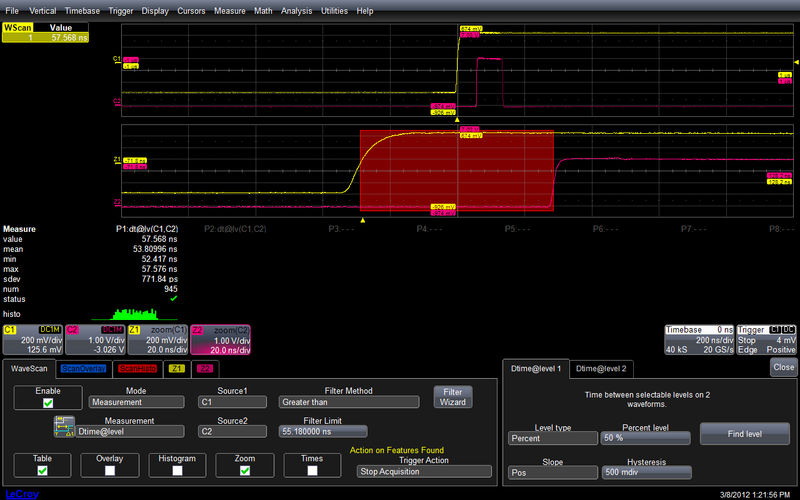 In this case, we're looking for waveforms with unusual dt@lv values. The histogram can be used to determine the search criteria. In Figure 2, a cursor determines the upper limit of the expected range of delay values. That cursor indicates that the upper limit is 55.18 ns. This is shown by the cursor horizontal readout under the timebase annotation box at lower right. WaveScan is set up in measurement mode to scan the incoming acquisitions and stop if the delay between C1 and C2 exceeds 55.18 ns. It has captured a waveform with a delay of 57.586 ns. This value is reported in both the value of the parameter P1, which shows the last measurement in the acquisition, and in the WaveScan table in the upper left corner of Figure 3. The combination of histograms and the WaveScan scan and search analysis tool can ferret out abnormalities of all shapes and sizes. In this example, statistical analysis, automatic parameter measurements, and the WaveScan tool teamed up to tackle the problem.